Dream home. Cliche, but appropriate. Appealing home design ideas are distinct to each individual, depending upon their taste. Some prefer classical styles, some a more modern approach. And if you’re like most of our clients, you love blending the two! Let’s look at some dream home design ideas that have been popular in 2016 with our Bethesda and Washington DC clients. Out with the old, and in with the old! While wood paneling hearkens us back to the 1970’s, it doesn’t mean that utilization of wood in decor is out. Old pine paneling, yes… but natural and unique wood on walls provides a focal point in today’s luxury new homes. Reclaimed wood and beams, bamboo or cork, all create a warm and inviting feel for any home. Whether in a living room, kitchen, office or bedroom, these walls become a custom creation heavily desired in the 2016 real estate market. Dark and dramatic is so 2000, think older school. Today’s consumers opt more frequently for homes with extensive open space, loads of light and soft colors – but they don’t necessarily want their home to look sterile and new. It’s all the rage right now to renovate a vintage home in Bethesda and the DC area to expand or open up spaces. Statuesque homes are being pulled into the modern era by expanding interior space while keeping historical aspects of the exterior intact. And that design preference is apparent on new construction too. People are building new homes that have a classic, high quality style. In other words, they look old. Impeccable and luxurious, but old. Often times classic Craftsman design is paired with modern features to give high style to the homes in the DC area. Homes are getting a one of a kind look with touches of chrome (and believe it or not, brass and gold tones are making a comeback), metals, and natural elements, especially if those elements create a light or sheen. Bring on the bling! Contemporary no longer means Brady Bunch strange. Bethesda and surrounding Rockville, Gaithersburg and Silver Springs areas are filled with every architectural style imaginable, so there is a style for every home buyer. The resurgence of “contemporary” architecture with often “interesting” roof-lines or floor plans, are once again in demand. Often overlooked because of the non-uniform style, these homes, surprisingly, offer, often, more space than meets the eye. 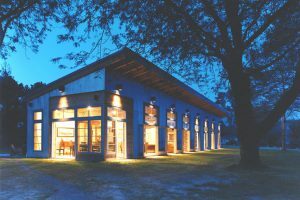 Therefore, renovation of these hidden gems becomes a consideration. Again, interior remodeling and shaping of a home becomes the focus. Combining interesting colors, roof lines, and materials to the exterior of these unique homes provides the structural stability of a seasoned home with luxury accents. This also applies to the most basic of styles such as colonial, craftsman or even farm house. Bethesda Magazine recently ran an article comparing Bethesda’s “burbs” and what one can expect for their individual budget. But what trends are demanded to upgrade these homes to modern live-ability? Inside is outside, and flex spaces are key. The days of having a wall between each room, to divide spaces, is as old as George Washington crossing the Potomac! Today, the open concept continues as the trend of active life-style demands, with high-end punch. Renovation of older homes includes opening walls and utilizing structural elements to provide a wide open feel with tons of natural light. The addition of a sunroom, open air loggia, luxury home spa, or gorgeous stone outdoor living space are a must-have for most of our customers. The feeling of being outdoors while remaining high and dry can take on incredible features. Customers also often require spaces with no label, often called “flex” spaces. Flex spaces provide the opportunity to add unique, individual space for each family depending on their specific needs. 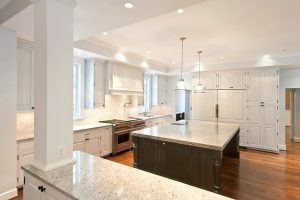 Renovations can be costly, so it’s essential to partner with a top local builder in the Bethesda, DC and Baltimore areas, to make sure all the details are handled properly. If you are in the greater Washington DC area, contact our team about your new construction or home renovation ideas for a free consultation! Kitchens are still key! This space remains a top priority for clients wishing to renovate or build a home in Bethesda. But it has gone a step further. Busy professionals require more than just a place to cook a meal. Kitchens are often congregation points for business dinners, charity functions as well as family meals. Therefore, as the gatherings grow, more space is required. The kitchen has become its own art piece, a space to wow the guest, and a point of pride for the owner. The ideal kitchen in 2016 combines functionality with chic elegance. Mixed natural materials of stone, copper, granite, travertine, marble and unique lighting, are highly prized by those seeking a home in Bethesda. Bear in mind that these materials may be pricey. Those wanting an elegant style with a limited budget can still opt for incredible kitchen designs with more modern flair. Soft colors and stainless or metal counter-tops provide the “bling” factor without the cost of stone products. Opt for a light palette including white, cream or pastel french country or shaker styles with limited dark accents. For appliances, choose stainless, or even,(GASP) white. Pantry and second kitchens? Continuing with the premise that kitchens remain the focal point of a home, often overlooked is storage space. 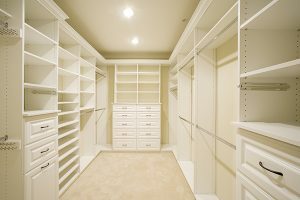 It’s no secret that women love a large walk in pantry. These spaces keep the trinkets and chips hidden, while providing optimum use of a custom kitchen. Like the kitchens themselves, the pantry areas are growing in depth and size. When considering a build or remodel, this one element makes a huge difference in the feel of a kitchen. Likewise, as “Boomers” retire, often a second kitchenette, in-law suite, or bar area is warranted in Bethesda homes. Dream homes start with dreams. Never to be forgotten, the master suite and the luxury demanded in this growing city, can make or break a home. Consumers want space, flex space, top materials and a relaxing atmosphere with a punch of individuality. The master space commands luxury features, such as trey ceilings with mood lighting, plush carpeting and architectural niches. The ensuite bathroom must provide individual breathing space, ample closet space and lavish style. These elements define the individual owner yet provide the intimacy of this retreat. The master suite is not JUST for zzzz’s anymore. It’s an individual statement of a refined home. These are but a few trends for home-buyers in 2016. Additions of custom elements like these further the desirability and significantly increase resale value for any home in the greater DC area. As Bethesda continues to grow, it has not gone unnoticed throughout the country. Fortune Magazine recently compared the valuation of Bethesda, and the greater DC area, to Aspen, CO real estate, which rises year over year. Consideration of this area for relocation, purchasing, or building a custom home, cannot be overstated. Building a dream home is an exhilarating task and requires only top professionals in the construction industry. Knowing design trends, and blending them with individual tastes, makes this area one of the most highly sought in the country. Don’t trust a dream to just anyone. Contact Rasevic Construction and let us build your dream.